The trick to making these potatoes "skinny" is replacing the butter and cream with chicken broth. Try them...you'll find you won't miss the fat because they're full of so much flavor. 1) Heat the broth and potatoes in a 4- quart saucepan over medium-high heat to a boil. Reduce the heat to medium. Cover and cook for 10 minutes or until the potatoes are tender. Drain the potatoes well in a colander, reserving the broth. 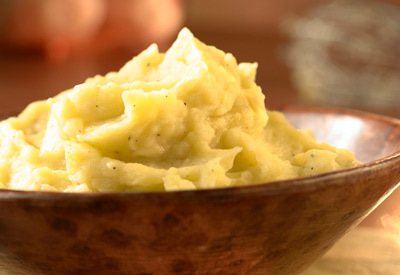 2) Mash the potatoes with 1 1/4 cups broth and black pepper. Add additional broth, if needed, until the potatoes are the desired consistency.